The Cumberland Hotel - The Cumby Pub, has played a strong community roll on the Port River during South Australia's formative years up until the present. The Cumby, as she is known to locals, was originally built at the edge of the Port Rivers swamp-front back in the day. As time rolled towards the 20th century, the Port grew, land was reclaimed to build the existing harbour and the pub now stands on terrafirma, situated directly across from Glanville train station. In those days, the hotel was used not only to serve its colonial ale but also as an auction house for the local land allotments, a coroners office when suspicious deaths occurred, a maternity facility, a meeting venue for town officials, new clubs, committees and disgruntled workers on the ship yards. Now, in 2018, we like to keep our customers happy by serving Ice Cold Beer, Great Wine, Bar Meals and Live Music in a pleasant atmosphere. Our pub boasts a fantastic outdoor area in the form of our beer garden, a refurbished front bar that we will continue to upgrade. With less than 25 meters to and from the train station and The Ports Walk, Jog Ride track around the river, our pub is an ideal destination to start and finish any journey to the Port Adelaide or Semaphore shopping and entertainment precincts. Or maybe just hop off the train and spend the afternoon or evening. Your publican, Michael Parker, or 'The Rev' as he is known to friends, is dedicated to venue improvements and creating an entertainment hub featuring live entertainment Thursday through to Sunday with the best of the local cover bands and Adelaide's best original artists performing more as we move forward. Meals are served Wednesday through to Sunday, 8 ball, darts and sports televisions are available all day everyday and a fun filled juke-box rock 8 ball knock-out comp every Tuesday. On the 12th September 1870 at the Bench of Magistrates in Adelaide's Rundle Street, John Gowling applied for the first liquor licence at the Cumberland Hotel, situated in the suburb of Glanville on the Lefevre Peninsula. John Gowling was represented by Messrs. Cullen and J. W. Downer. 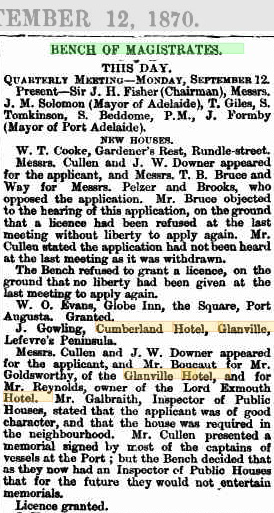 Licensee's Mr. Goldsworthy, of the Glanville Hotel, and for Mr. Reynolds, owner of the Lord Exmouth Hotel apposed the application and where represented by Mr. Boucaut. Subsequently the licence was granted and John Gowing became The Cumberland Hotels first legitimate publican. In the year 1870, four months prior to the Cumberland Hotel being granted its first liquor licence, Port Adelaide's river traffic was growing significantly causing John Rann, Mr. Leicester and Mr. Ireland to form a sporting club to benefit local wharf workers. 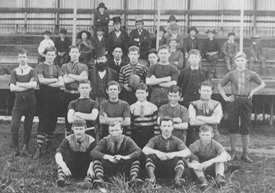 The Port Adelaide Football Club was established on 12 May 1870 as part of a joint Australian football and cricket club with the first training session taking place two days later. It played its first match against a team from North Adelaide known as the 'Young Australians' on 24 May 1870 at inaugural club president John Hart Jr's fathers property, Bucks Flats in Glanville South Australia. You made all the required mock ups for commissioned layout, got all the approvals, built a tested code base or had them built, you decided on a content management system, got a license for it or adapted open source software for your client's needs. Then the question arises: where's the content? Not there yet? Urbanitas similique ex nam paulo temporibus ea vis id odio adhuc nostrum eos.